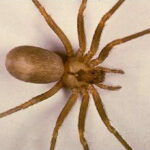 Size: May grow to have a body about 5/8-inch in length and a leg span of about one and a half inches in diameter. Color: Usually light brown but may be darker in some specimens. The key identifying characteristics are the six eyes arranged in three pairs at the front of the head area and the fiddle-shaped marking on the back. The brown recluse spider is often called the “violin” spider or “fiddleback” spider because of the distinctive fiddle-shaped marking on top of its cephalothorax (head end to which the legs are attached). Recluse spiders are often misidentified as southern house spiders (Kukulcania) or a short bodied cellar spider (Physocyclus). It is important that you get your spider properly identified. Many people misinterpret the markings on spiders as “violins” and feel that they have found a recluse. A local extension office may be able to assist you with a proper identification. Like most spiders, the brown recluse spider does not seek to bite people. The bite is usually accidental. The spider crawls into a shoe, into clothing or into a bed and a person then puts on the clothing or lies on the spider in bed. The spider, being trapped, has only one defense – and that is to bite. Unfortunately, the bite of this spider produces a nasty result in people, such as open, ulcerating sores. Left untreated, such bites often become infected and significant tissue necrosis can occur. It is always best to seek medical attention, preferably from a dermatologist, if you think you may have a spider bite. This is especially true in areas where brown recluse spiders are common. The Brown Recluse spider can be found in the southern, western and mid western United States, especially Arkansas, Oklahoma and Missouri. Any corner inside or outside is suitable for brown recluse spiders to construct their webs. These spiders are more common in garages, crawl spaces, and basements, as these areas are less disturbed and tend to harbor more insects. Treating with a residual insecticide may help. Products such as Talstar, Demand, Tempo, or Fendona SC, can be applied around the foundation of the structure, window frames, door frames, soffit areas, vent openings, exhaust areas, garages, basements, mounted lights, air conditioning areas, cable entry points, deck areas, stoop and patio areas. Dusting is useful if there are voids such as electric outlets, switch plate covers or vent areas where spiders are emerging. Using Drione, or Delta Dust in the attic area would be a good measure if there is an infestation in that area. Or you can apply Delta Dust to your crawl space, as it is moisture proof. Clothes left on the floor, in a clothing basket, or are otherwise exposed should always be shaken well and inspected before putting them on.